I am going into my fourth week since hip replacement surgery, and there’s not a whole lot I can do right now. I still can’t do much weight bearing on my left hip (leg.) I’m getting a little bit of “cabin fever”and have been trying to think of a few things I can do sitting down. I really enjoy making meals for friends and family, and thought I may be able to tackle spaghetti and meatballs for some friends of ours. I retrieved two packages of venison burger from the freezer and let them thaw out overnight. I’m always looking for new ways to prepare the outdoor bounty I have in the freezer, and figured I could have my wife put the ingredients on the cupboard and I could do the rest! I started with 1/2 a cup of Italian bread crumbs in a bowl, followed by a half cup of crushed saltine crackers! I then added a teaspoon of salt and a half teaspoon of pepper. To these dry ingredients I added some Lowery seasoned salt and half a finely chopped up onion. My wet ingredients consisted of two eggs, 1/4 cup of milk, a can of cream of mushroom soup, and a dash or two of Worcestershire sauce. 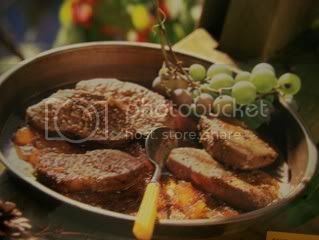 I then added the venison and all the ingredients into a large bowl and mixed everything together. I took large glass baking dish and sprayed the bottom with olive oil. I rolled the 1-1/2 inch meatballs and lined them in the baking dish. When the oven reached 350 degrees I added the meatballs. When they looked done (approximately a half hour) I removed them for a taste test! I’m not bragging, but honestly these were the best tasting Swedish meatballs I have ever eaten. After devouring seven in about 1 minute, my wife reminded me they were made for our friends, and if I didn’t slow down there wouldn’t be enough for the spaghetti! Wow! That was hard to do! So if your looking for a easy recipe for great tasting venison meatballs this is it! Now I have to retrieve a few more packages of venison burger for myself. A few members of my family are squeamish about eating “wild game” so I don’t always broadcast the fact! Last evening three of those members stopped by and enjoyed the “wild game”so much so I had to “cut them off” from their taste test! Always makes me feel good when uninformed are enlightened concerning the bounty provided by nature! I have almost exclusively worked with Meghan and must say I am more than well pleased with her knowledge of human anatomy. She has been with Advanced Physical Therapy since 2005 and has her B.S. from Grand Valley State. She is so pleasant to work with and is always smiling and upbeat. She knows just how far she can push a patient, and also knows when to back off when called for. I have had therapy at other places in Monroe, but the knowledge and atmosphere at Advanced will get your attention the minute you walk in the door and are greeted by Dawn’s lovely voice. Dawn is the day shift front desk receptionist, and Lori is the afternoon shift receptionist. Mary is a graduate of Eastern Michigan University and treats upper extremity injuries with a specialty in shoulder rehabilitation. Mary did a 10 year stint at Mercy Memorial Hospital and has been helping patients overcome injuries for 25 years. Also on board is Bobby who is a rehab technician! He sort of floats from one area to the next whenever he’s needed. He’s iced me down on several occasions after a taxing workout! Advanced Physical Therapy is located at 1291 N. Telegraph Rd. across from the old La-Z-Boy offices next to O’Reilly Auto Parts. There phone number is 734-243-0300! The state’s agriculture commissioner said Tuesday that he has a solution: a human blood-thinner that proves especially deadly in swine. Potholes Are Costly And Dangerous! Monroe County is notorious for its bad roads, and lack of cooperation between townships when it comes to fixing said roads. Rauch road was a prime example of “Roads Gone Wild!” Erie, Lasalle, and Ida townships couldn’t seem to find some common ground when it came to saving the lives of their townships taxpayers until recently! Anyone who knew about the dangers of traveling down Rauch road, would steer clear of this death trap, even if it meant having to drive miles out of the way! Thank God it is now fixed, but their are now new dangers in the county! Sad thing is Rauch was not the exception in Monroe county. It’s more the norm, and it ticks me off every time I think about our tax dollars and library fines going towards fixing, repairing, and replacing these bone jarring, frame bending, tire busting roads. Just today I passed two Monroe County road crews busy repairing a few of our chuck holes. I even got to help as I packed down the cold patch with the weight of my vehicle. North Custer (just before Plank) is a nightmare, and all the cold patch in the world ain’t going to help this section of road. Never the less we have are trusty road crew throwing shovels of cold patch into car swallowing holes, knowing that there is “job security” in what their doing. These so called patches won’t last very long, so they can come back and do it again soon. Just two years ago we had a bridge repaired (didn’t see anything wrong with the old one) on Reinhardt Road. Now mind you the repairs are less than a 2 years old, yet a portion of the concrete blocks have already fallen off the bridge foundation, and there is a huge 8 foot by 8 foot section of “new” road that is already being patched. Something is wrong with this picture. I’m sure somebody was paid good taxpayer dollars to do this job, and do it right. Who takes responsibility for this and the rest of the roads that need a total makeover. A New World Record Whitetail Shot In Tennessee? Who would believe that this past fall a whitetail deer would be felled by a muzzleloader that would challenge the present world record non-typical. A 27 year old farm boy named Stephen Tucker will become one of the biggest celebrities in the whitetail hunting world, and no doubt a millionaire to boot! It all started with Stephen getting a 15 second glimpse of this monster while combining on a 50 acre farm his family has leased for decades. Stephen immediately set out two trail camera’s and started getting pictures right away. He was able to pattern the deer to 5 days moving at night to 2 days of showing up in the morning hours. Stephen started hunting at an early age and had taken a few turkey and a couple decent bucks, but this “bad boy” was way out of his league, and he knew it. Not being much of a bow hunter Stephen only set-up twice on the deer and actually saw him, but took no shot. He was bound and determined to be patient and wait for the right opportunity to draw down on this extraordinary deer. His plan was to wait for the November 5th muzzleloader season and hope that the buck had eluded others who were “on” to this huge deer! There was a large thicket on Stephen’s 50 acre lease and the buck seemed to be holed up there on most days. He had a scrape line coming out of the thicket on the corner of a field, and that’s where Stephen set up his pop-up ground blind. On opening morning Stephen was in his blind very early in order to let things quiet down if need be. Things moved fast as the giant buck appeared at the doe urine freshened scrap just 30 yards away from the blind. Stephen wrestled with his neves and by the time the deer was in his crosshairs he was moving on down the scrap line. Stephen squeezed the trigger and the primer was all that went off! Of all times for a drey fire! The deer looked in Stephens direction, but did not appear to be spooked as he continued on his rounds. That evening Stephen saw him again at 162 yards, but would not chance a shot at that distance. Stephen let the area sit for the Sunday afternoon hunt, but was out bright and early Monday morning. The deer actually walked past his blind in the dark that morning, but returned to the scrap after daylight. Stephen had to shoot through the mesh widow opening, as he didn’t have time to remove it. With the gun barrel inside the blind Stephen touched off a shot at 40 yards. Of course all the smoke prevented him from seeing just what was happening but he know his shot was good. After waiting an hour he and his buddy Morris tracked the deer into the thicket. Not hardly any blood to begin with it soon picked up where the deer run forked off inside the thicket. The deer was not far from that point and until Stephen held those world class horns in his hands he could not believe the size of the mega buck! Stephens deer has been green scored as a non-typical with a Boone and Crockett score of 312 inches. The current world record scores 307-5/8th by Tony Lovstuen which was taken in Iowa in 2003. Most scorers agree that Stephens buck will hold out to be the new world record after the required 60 day drying period. This is one deer that will be talked about for a long long time to come. Congratulations Stephen Tucker! WYOMING, MICH. — The person who set up a bed of screws to protect a marijuana grow operation, seriously injuring a Wyoming police officer, might face charges if prosecutors can find a criminal statute that applies. It’s harder than they thought. Existing law covering booby-traps addresses spring-loaded devices and explosives, but apparently not a bed of nails or screws on private property, Kent County Prosecutor Chris Becker said. “We are looking into it, but it’s not something that’s readily apparent,’’ Becker said. And that has Wyoming Police Chief James Carmody calling for change. Wyoming officer Dustin Cook was investigating an early Sunday break-in at a medical marijuana grow site when he scaled a gate to reach a broken window. On the other side was a sheet of plywood with more than 100 three-inch, threaded decking screws pointing upward. Both of his feet were impaled. Events that led to Cook’s injuries unfolded about 1:30 a.m. Sunday when Wyoming officers responded to an alarm at a licensed medical marijuana grow operation on Clay Avenue north of 54th Street SW. When officers arrived, they encountered two men inside the gray brick building. They entered by breaking a rear window, police said. Both were dressed in black with their faces covered. The pair fled; police gave chase. The first to be caught was 19-year-old Tyquan K. Hassel of Kentwood. Police say he tossed a handgun during the pursuit. His alleged accomplice, Andre D. Sims, also 19, made it a bit farther. Police had to chase him across Buck Creek. When officers caught up with Sims, he was on a cellphone and overheard saying “they got me,’’ court records show. Both are charged with breaking and entering a building, which is punishable by up to 10 years in prison. Hassel is also charged with carrying a concealed weapon, a five-year felony. They are due back in Wyoming District Court Feb. 22 for a probable cause hearing. Police found an elaborate marijuana grow operation; more than 90 mature plants were found, investigators said. That exceeds the amount the licensed marijuana caregiver was authorized to have. Carmody says he is mystified why the grower felt the need to use a bed of screws when the building had a working alarm system. Officer Cook, a six-year veteran, is in a lot of pain, the chief said. This sort of set up can also happen in the fields and forest that so many Michiganders use for recreation. I think it’s just a matter of time before an innocent outdoors person gets seriously injured by a bobby trapped grow site on state land. The more remote your stroll, the more chance you’ll find a grow! Be aware of your surroundings at all times and travel with others while exploring the “back country” is my advice! These are some of the things I carry in my backpack when turkey hunting. Season opens herein April, and last report was winter has been a “no show” over much of the state. We got a little around the cabin last evening, but thankfully Monroe missed most of it. I put in for the first hunt as did my soon to be son-in-law Dave. This years mild and wet winter should work to our advantage, as mating season should be right on schedule! In the picture (from left to right) you’ll see my Ben Lee twin hen box call first. It actually will make two different tones imitating the hen turkey. Next is my small “Latham” slate call. This call is very compact, but has a excellent sound with little movement on the callers part. I’ve had this call for 25 years. Next is my Primos “gobble box” which makes a good gobble sound. In the background is my Ben Lee slate call, and the one on the end is my latest call made by “Mad River.” It’s the River Otter model, and presently my favorite box call. Hanging from my big Tom’s neck is my Quaker Boy owl locator call. 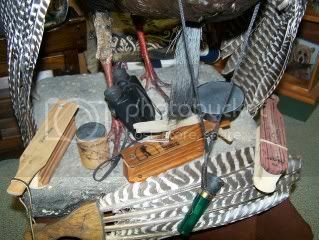 I also use a crow call and have tried the peacock call to locate roosting birds. Also pictured are my Bausch and Lomb binoculars, a very necessary tool, as your quarry’s eyesight is next to none. You will notice the absence of a diaphragm call, as my gag reflex works overtime whenever I put one in my mouth. The “wing board” in front is for making an early morning sound of turkey’s leaving their roost, as you flap the wing through the air. Pattern your shotgun before going afield, and make sure you take a head/neck shot. It’s always nice to catch him in the middle of a gobble, as you squeeze off the shot. I use 5-6 shot myself, and may even use 4 shot if the situation calls for it. You do not necessarily need decoys, but they certainly do work, especially in the early season. Many guys are now using multiple decoys (me included) and a jake decoy or a mating set also work well. The most important thing about turkey hunting is staying well concealed. A pop-up blind will allow you some movement in the darkness of the blind. If your on the ground any movement, you make, will likely work against you. It’s best to have your shotgun resting on your knee or shooting sticks before the turkey gets very close to your position. Sometimes a Tom will come into your calling unannounced! These silent birds are definitely more likely to give you the slip, so you have to be on “full alert” at all times. Be like my old boxing coach Joe Giarmo, and alweays keep your guard up! Good hunting guys and gals, and children of all ages. Hip Replacement Surgery Wildwood Orthopaedic Hospital Sylvania Ohio! Sorry it has been so long since I’ve written a post, but I have a great excuse! My left hip was totally replaced less than a week ago, which has left me quite immobile! I started having hip pain about a year and a half ago after my 69 year old body attempted a 150 yard low crawl to intercept a large Tom turkey that got “hung up” on a fence row. Pain (on and off) persisted in much discomfort while hunting, climbing, golfing, and anything else that involved movement of my lower extremities! The wear and tear of working on our new cabin brought things to a screeching halt. It got to the point where I couldn’t walk 100 yards without having to stop and catch my breath, due to the pain in my groin! The surgery lasted two hours as a 7-8 inch incision was made to remove the old and “install” the new! I must say the Doctor and staff at the hospital were top notch and even the hospital food was very good. Of course a shot of morphine will do wonders in turning a very painful situation into “I’m superman can I go home now?” In retrospect I should of stayed a day or two longer, but the insurance companies want you out of there asap! I have had three sessions of therapy since coming home, and need a walker to move around, but all in all I can see improvements in my mobility. You would be surprised at what you can find in someones shed, old shop, or a garage sale! I personally am not one to hunt through someone else’s “stuff”, but my older brother Randy is! He is particularly on the lookout for old taxidermy mounts, and I would say he has hundreds of whitetail deer horns and mounts cluttering up his man-cave! Randy recently purchases 160 acres and a cabin near Onaway. His very first year of deer hunting they took 5 bucks off the property with his 10 year old grandson shooting a 135 inch 10 point. Randy has spent a lot of time up north and is not bashful about checking to see if you have anything of interest to him in your garage, barn, or building! Several months ago he was riding on an old back road and came across, what looked like, a closed “second hand/antique shop!”He noticed a guy cutting grass nearby and asked if he knew who owned the building? Turns out he did and to make a long story short he let Randy rummage through it. Well low and behold he found just what he was looking for. The guy had a pre-Michigan tag mounted deer head that was a monster. The mount itself was “ratty” but the horns were spectacular. The 17 point non-typical has more mass than I’ve ever seen on a deer, and my rough score on it is right around 180 inches! The plans are to put a new cape on it and hang it where people can appreciate a deer harvested from the lumbering days of the northern Michigan forest. Winter Venison And It’s Benefits!